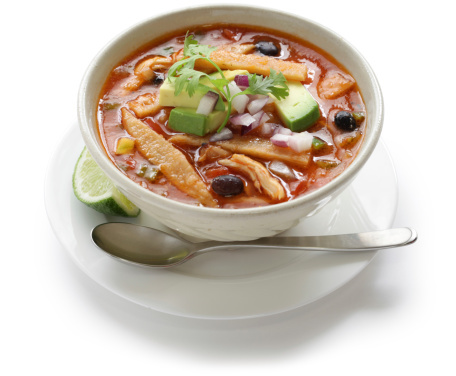 Oh so tasty, tortilla tilapia soup made with only the freshest ingredients is a warm bowl of liver-loving goodness. Be sure to use unsalted tortilla chips to keep this dish healthy. In a large glass baking dish, combine 5 tablespoons of fresh lime juice with the garlic, cayenne pepper, and cilantro. Place the tilapia filets in the marinade for 10-15 minutes, flip once or twice during this time. Blend the cubed tomatoes and onions. In a skillet, bring the tomato-onion mixture and the water to a simmer on low-heat. Add the tilapia and marinade. Cook for 8-10 minutes, or until the tilapia is firm. Using a wooden spoon or spatula, separate the fish into smaller, bite-sized pieces. Place 3/4 cup of broken chips into serving bowls. Pour soup over the chips. Top with chopped avocado, a dollop of Greek yogurt, cilantro and/or a dash of lime juice if desired.